It started with hearing the news that Lou Reed had died and pulling out an old LP by the man (that also took me back to some old memories). But putting it back the next night is why I listened to The Pretenders. I have only worked on one political campaign. I was fresh out of college. Bob Edgar lost. I was gathered with others who had worked on the campaign. A song came on the radio, and a woman next to me said, "They just don't spit vile like they used to." I don't think I ever saw that woman again and her name is gone, but I so remember that quote. She needed music that was raw and angry that night. Bob Edgar went on to do some fabulous things outside of politics. Years later Arlen Specter would gain my respect for being a moderate in a polarized DC. I had a student that once said, "Why jazz? Can't we listen to rock." I said, "Sorry, I am no longer an angry young man." When I said I wanted to continue to experience awe in my studio as I prayed in August and ever since, this is what I meant: please God, let the beauty of your light streaming through glass always amaze me. And, God never let me lose the amazement that friends and folk I have never met have trust in me to create unseen pieces of art for them. I placed this piece in my room on the evening I entered silence in August. The plan was to give it to my spiritual director. But plans change if you allow them. The glass did not want to be in my room, so I moved it out to where folk wait to see their spiritual director. It faces east. It dug the sunrise. Then an idea came to mind and I created a rather large and complex doodle for my spiritual director. 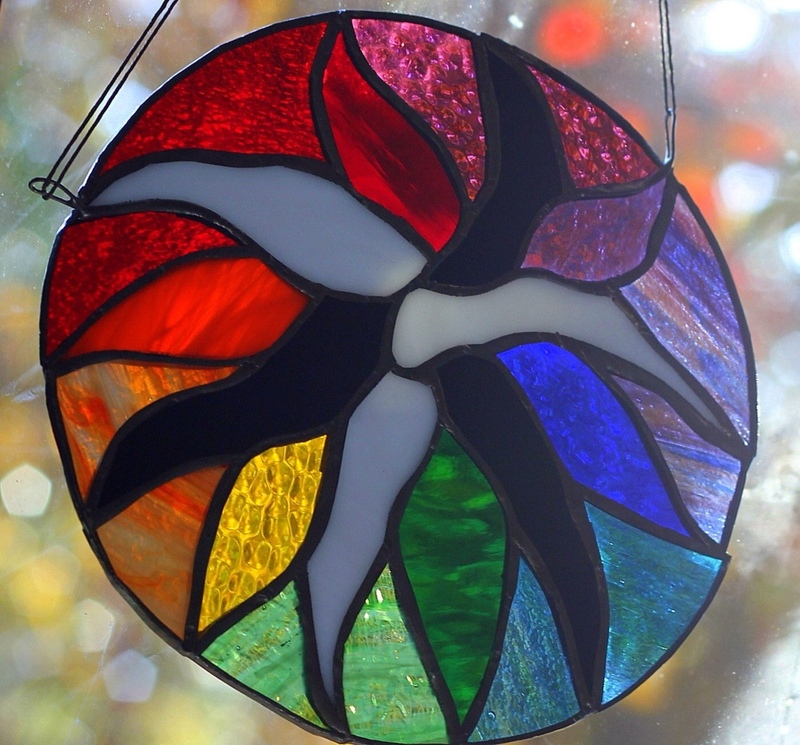 On my last day, I handed the stained glass to a Jesuit and suggested a place it could hang. Today I got a post card from the Jesuit. They have decided otherwise, it will hang on the first floor, facing west. He invited me to come see it. That will happen. I dig sunsets too. Back in the day, a biology professor handed me a book of short stories by Raymond Carver. It may have been the first collection of stories I ever read. I was hooked. Two years later, I met Mosaic Woman, who introduced me to many things Canadian. There was a writer of short stories in that introduction, Alice Munro. Her stories amazed me. Someone once said that Munro did not have to write novels because she could get more into a short story than what is found in many novels. I have at times searched through fiction settings in libraries and bookstores for stories. I find novels and novels and novels... and then at some point a collection of stories. The pressure must be intense. Forget stories. Write novels. Munro just kept writing stories and that impressed me. So, I was delighted. An author, who tells stories in short splashes of color and who reminds me of those glorious days of falling into love with Margaret, was on the news. Good news indeed reached my spirit as I commuted this morning. Our garden has witnessed my care on 27 of the last 33 days. It has been transformed, but as talked about in part 1, transformations take perseverance. I have pulled many more weeds, but I have taken the next step and have placed 30 perennials into the ground. I wanted some fall color in the front yard so this aster has been placed there. I am not much for garden design. I do know to plant tall things behind short things. But what I do is pick up a plant. Read the info on the tag. Find a place. Repeat. Repeat. Repeat. Things will die. Things will thrive. The garden will unfold. It will provide beauty. The sunflowers are looking rather dead, but not completely and goldfinches have been around so these will stick around and provide comfort to the birds and my spirit this winter. The dahlia,that returns each year, needed to be raised up from the ground upon which it had toppled. Blooms were broken off. This bud bloomed inside our kitchen. Pale in color but not beauty. The first batch of perremnials came by way of Bowman's Hill over by New Hope. A place I had desired to see for decades and their fall plant sale got us there. This is how they looked on our porch. So it was time to have my photo taken. New glasses, a transformed garden, a weeded patio/walkway. Now to keep those perennials alive. Who knows, with luck they will join this rosemary as plants that have thrived. Yesterday a student came in to my classroom. He had reached a level hat gav him the privilege to come to horticulture. His first words affirmed that it is quite the different place. One day it will be another's place to teach. For now, it is mine. And for that I am grateful. 1000 posts on Stratoz, an enterprise started in 2007. I think a few were deleted, but most remain to help me reach a thousand ramblings shared on ~> God and Jazz. Glass and Science. Teaching and Gardening. Lansdale and Mosaic Woman. Food and Art. Probably some need some fixing up, but I am OK with an imperfect blog. My posts are shorter these days but I think I still have the same focus. Celebrate the things I dig. Maybe it is a bit too diverse to get a rabid following from the masses, but I do have a fan base and for that I am grateful. I got new glasses on Saturday, much to the amusement of a friend at church. And considering the long week she had, I have no problem with bringing some joyful entertainment into her life. This post does not show the 30 perennials I planted in the last few weeks, but it does show some Hostas that came with the house and may not be here when the next owner moves in. I have gardened eight straight days and 16 of the last 18. Much of that time was spent removing weeds. Mostly from the backyard and from the dreaded brick patio and path leading to the garage. I am not done, but I enjoy weeding. Being on my hands and knees removing what I don't desire. The truth is, I will never be done. Gardening is about perseverance. Any of the world's great gardens, would not be so great without perseverance. In the spring of 2008, I was coming off my best year of gardening. 2007 was a year of persevering. What happened? This and that. A new hobby turning into a new business turning into a true passion for glass. But I like to weed. To be close to the garden. To watch bees being fed. To sit on the porch and take a break. To say hello to my two closest neighbors an to many more who walk past my house. There are times I have wondered why I removed all the grass. The answer is beauty. This week my commute to work has started by being greeted by goldfinches feasting upon coneflower seeds in my front yard. Saturday at Holy Trinity I reach my seat after communion having asked God to renew and cleanse me as I often do when I reach out for the bread and the wine. But since I came back from the silent retreat I count to seven on my fingers, hoping to remember the desires I shared with God. One night in the midst of silence, I noticed a hawk on the highest point of the Jesuit Center. I wondered when crows would chase it away. I walked about. An hour or more later it was still there, which delighted me but also made me wonder if it was real, so I ventured closer till I saw its head turn. I guess it was enjoying the view. The next evening I ventured out and happened to look up at the UCC church adjacent to the Jesuit Center. And there was a hawk at the highest point. At no point in time did I see a hawk when I looked up at these two perches in the following days. But looking up is a good habit. There is much to be seen other than hawks. I drove up to sunflowers that dazzled me Monday at noon. The eight days of silence had gone as smoothe as any retreat I had been on, it felt comfortable from beginning to end. Well, except my spiritual director kept asking me how I felt about this, that, and the other thing. But that's her job, too take me deeper into my experience. I fully expected to come home and storm social media with a last days drive to meet my campaign to feed the hungry. And it started that way, but it just didn't feel right. And the hours are ticking by to midnight in California turns the campaign to a pumpkin on August 31. I want to write reflections, not flood the Internet with requests for help. Nearly 30 years ago I was walking door to door trying to spread the good message of the environment. I was OK with getting folk to listen to me, but terrible at raising money. Thus I did not get paid to do it for very long. I am pleased to having raised over $1000.00. But I am tired of asking for money. I have made Manna on Main known to my friends. I have passed along some information about hunger. But I feel more compelled to be in my studio, in my garden, and with friends then doing a final flurry. I once rode my bicycle to the Catskills. I would pull into campgrounds much to the amazement of those, who had arrived in trucks pulling campers. What I remember most from the trip is the desire those new neighbors had to feed me. I was far from starving, but I was much better fed when I moved on the next morning. I did not know where I would stop, but it always turned out that I was invited to a meal. Now I am curious how that kindness might have led to a lifetime of supporting people who feed the hungry, and to the pleasure I have inviting folk over for dinner. As I write this, I am hoping to draw more cards of thanks for those who support my goal of 21 hundred dollars. But I am ready to be content passing on these final thoughts. Volunteer, they need hands as well as money. Put a huge basket for canned goods in your church or office. The journey ends where it began. as a Pennsylvanian German raised Lutheran, there is something very welcoming of being able to eat a pretzel anytime I want one. as one who loves to roam, there is plenty of space to do that. But I have to admit that my favorite place to roam is into the UCC cemetery where I always have a good chance to see a bluebird. The library not only has the full set of the Oxford English Dictionary, but is also where I found the complete stories of Flannery O'Connor. The bookstore is well stocked and a fine place to visit. The only thing that stops me from buying books is knowing I own so many I have not read. I don't really dig swimming, but the last place I swam was there. I really do dig pool tables and rarely have a chance to play. I have even had silent games when a fellow lover of the sport arrived upon the scene. Sister Maria has developed this silent retreat that led me to know Sophia. How many pieces of art have I created with 21 pieces because of that week long retreat getting to know Lady Wisdom and her 21 attributes. A reminder of how art can transform a life. It was seeing this mosaic that sparked the desire inside of Margaret to become a mosaic artist.